Is it possible to have children, while living a nomadic life? Anyone here has an opinion on having children, while living a nomadic life? Is anyone doing this right now? What are your experiences? Where are good places to live with children? I guess we would rent a house with garden and hire a local nanny/household helper. Do you think it’s an advantage for kids to grow up internationally with both parents being around more than usually? Let me know what you think. I know Graham Brown is doing it with his Japanese wife. Sadly he doesn’t write too much about family matters. Then there is also a family blog, I only recently discovered, but didn’t get a chance to read yet. I think there are quite a lot child-friendly places around the world. Countries of SEA or Australia/NZ might be good options. Thanks. Those are both great resources. Superstar-blogs. I think it can be awesome for kids to grow up in a more adventurous environment than a traditional city. It will probably make them more creative too. There’s always the problem of when they need to be schooled at around age 5. If you keep moving around then, they won’t be able to make/keep friends etc. That’s a real problem I think. Not sure exactly what you mean, but yes, you can homeschool while traveling. We use digital programs mostly (traditional textbooks too heavy to travel with), and it’s going great! We quit our jobs to travel indefinitely with our kids earlier this year, and it’s honestly one of the best decisions we’ve ever made. Our kids are aged 5 and 7 right now, and so far, they love this new lifestyle. It depends on what you have in mind. We travel slowly, spending a few weeks to a few months at a time in each destination - with kids, you can’t get as much done, can’t sightsee as fast, so you need to allow more time in order to avoid frustrating yourself, or them. We usually rent apartments or houses - with kids the extra space comes in handy. I think there are pros and cons to whatever you do. You can raise them traditionally, have bad luck and end up with grown children who are drug addicts (ie. if for some reason they are attracted to the wrong crowd in school). Or you can raise them on the road where they will be more sheltered from THAT, but maybe they’ll grow up to hate you for not letting them live a normal life. OR maybe they’d be fine in regular school. Or maybe they’d be perfectly happy as adults with having spent their childhood on the road. There’s just no way to know for sure. What is encouraging is that IF you go the nomadic childhood route, as far as homeschooling goes, there are loads of studies showing that homeschooled kids on average, do at least as well as their traditionally schooled counterparts, both socially and academically. The nomadic part is an unknown. I think you can mitigate some of the potential downsides simply by being aware of them, and trying to make up for them. That should put the odds in your favour of everything working out ok in the end. And yeah, I do think there are HUGE advantages to exposing one’s kids to the wider world - better than having them grow up in a bubble, afraid of the unfamiliar, intimidated by it. There’s a level of confidence you get from knowing you can thrive anywhere you’re planted, know what I mean? Hopefully this helps some. Good luck in your decision! Christine Gilbert travels with her family and writes about the experience. Her blog’s also won some awards. There is a few RV families that I’ve read about that travel on the road and all homeschool. One is traveling with like 12 kids in ONE RV. Not joking. I definitely agree that it’s great for kids to grow up internationally - military brats for example. Thanks for the great input @Sheralyn (do you have a blog by any chance?) and @amy. How are your kids supposed to make friends, when they have to leave them behind again and again? In his book, Graham Brown suggests to go to every available social meetup. This is not really a satisfactory answer. How do you handle this @Sheralyn? re: kids and friends - I guess I just have faith that there is more than one way to raise a little human than packing them off to school to sit in a room with 20 kids of the same age for 5 hours a day, 5 days a week. If you do this, you’d have to be prepared to answer well-meaning friends, family, and strangers asking you that over and over again - so get ready!! As for making friends, one advantage of this lifestyle is that they’ll get lots of practice meeting new people (more than they ever would at home) - my hope is that such experiences will make it that much easier for them to form friendships since “breaking the ice” will hopefully become second nature to them. Additionally, we are trying to connect with other long term nomadic families - there should be some opportunity for meet-ups and the like (arranging one such meet-up for later this week actually!) - but it’s true that such friendships will be different than the kind they would form at traditional school - however, I don’t think different (ie. staying in contact via FB, e-mail, with occasional in-person meet-ups) is necessarily bad… just different. And lastly, you’ll always have the opportunity to change course if it turns out that your future kids, or you and your girlfriend, is unhappy with the way things are going as a nomadic family - nothing is set in stone. I agree with Graham’s advice to go to every available social meetup too. Good advice for sure! To be honest, I think in this internet age, nomadic families will become more common as time goes on… more and more people are waking up to the fact that it’s possible to raise your children this way and not mess them up No guarantees, I know… but no guarantees with the traditional route either! Barefoot Journal by Paul Graham, 1 kid, writes books while traveling with his Japanese wife. y Travel Blog, also 2 kids, some marketing but also many homeschooling resources. A king’s life, 2 kids, lots of outdoor stories, blog currently inactive, but current posts on Facebook. Her husband is a friend and former colleague of mine. They seem to be doing well with their two kids! For consistency you’d really have to stick to homeschooling, but make sure they get socialised locally by joining clubs, sports groups and drama groups and stuff (like Felicia Day did as a kid!). I personally recommend groups like choirs too, as you’re working towards a performance and then they can move on afterwards. There are some countries that are really against homeschooling, though, like Germany. You’d probably have to enroll them locally if you went through a country that disapproved of it, which wouldn’t necessarily be a bad thing occasionally. Personally, we’re doing slow-motion nomadism and can enroll our kids locally. Yeah. Germany is totally against it. That law dates back to the time of Nazi Germany and they never changed it. In Austria it’s much easier. They just need to do a test once a year (in June) at any school in Austria. I just don’t know if you can do it without a residence. I know that people here are against international schools (expat bubble, elitism, etc), but sometimes they could be a convenient option. A few weeks ago, I asked our PA to research the cost in popular Asian cities. Here is the list he came up with (as a rough guideline). We’re doing it this year And there is a fabulous worldschooling FB page I am part of with over 1,000 worldschooling parents. So inspiring! The Zapp family did it, and still are on the road. Their kids were even born on the road. 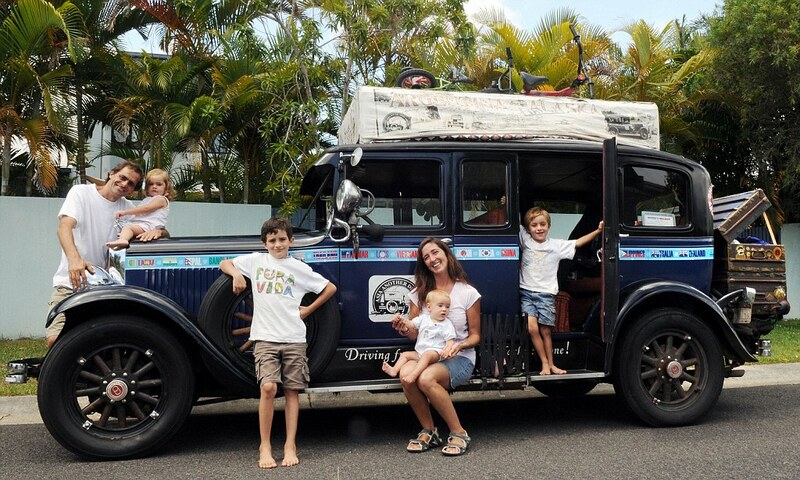 For the last 13 years, Herman and Candelaria Zapp have traversed the coasts of South and North America, Asia, Australia and Africa in their 85-year-old vehicle which has also been their home. Sheralyn can I interview you for my blog? Hey Jasmine! Yes, absolutely - probably easiest to just contact me via our blog Contact Us page, and we’ll figure out the details? Thanks to everyone who joined the discussion so far. There is now a dedicated #_family channel on http://hashtagnomads.com. If you travel with children or plan to, please join and share your experience. Just to throw out an alternative to home schooling, I have a past co-worker who used an online private school, k12.com, for his children’s education. 1dad1kid - single dad, props! A little adrift took her tweenaged niece along with her for a year - I love the idea!